Did Viking find life on Mars? In 1977, NASA answered no, even though at both Viking landing sites the three biological experiments yielded positive responses.... And in many simulations prior to the mission, such results were never false. But another Viking experiment detected no organics in Mars' soil. Favoring that result, NASA decided that life had not been unambiguously detected and came up with an ad hoc explanation (hydrogen peroxide in the soil) for the positive responses in the biology experiments. Gil Levin, who designed the most sensitive of Viking's life-detection experiments, noted right away that NASA's organics experiment was less sensitive than his by 4 or 5 orders of magnitude. NASA knew, in fact, that the organics instrument could not detect the organics in Escherichia coli unless there were more than 10^6 cells per gram of soil. Levin's Labelled Release experiment could detect as few as 50 cells. Now an international, interdisciplinary team has retested the Viking organics detection system against soils obtained from Mars-like deserts on Earth — soils known to contain organics. Heating the soils to 500°C, as was done on Mars, they saw no organics in 11 of 14 cases. Therefore, the question of whether organic compounds exist on the surface of the planet Mars was not conclusively answered by the organic analysis experiment carried out by the Viking Landers. In other words, Viking may well have found life on Mars. Rafael Navarro-González et al., "The limitations on organic detection in Mars-like soils by thermal volatilization–gas chromatography–MS and their implications for the Viking results" [abstract | Open Access pdf], 10.1073/pnas.0604210103, p 16089–16094 v 103, Proc. Natl. Acad. Sci. USA, 31 Oct (online 23 Oct) 2006. Viking landers may have found Martian life after all, by Mark Buchanan and David L Chandler, NewScientist.com, 23 Oct 2006. Life on Mars! is the related CA webpage with more about Viking and Gil Levin. Thanks again, Jerry Chancellor. You go, Gil! Bacteria deep underground subsist on radioactivity. Scientists from nine collaborating institutions went 2.8 kilometers deep near a South African gold mine where they found a community of bacteria distantly related to Firmicutes. The bacteria had been isolated there somewhere between three and 25 million years. Hydrogen that they need for respiration comes from water decomposed by radioactive decay of uranium, thorium and potassium. Radioactivity also drives the production of sulfur compounds that provide the bacteria with a high-energy diet. These sulfate reducers were sustained by geologically produced sulfate and hydrogen at concentrations sufficient to maintain activities for millions of years with no apparent reliance on photosynthetically derived substrates. 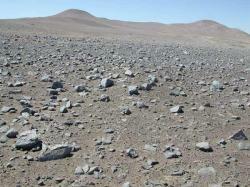 Members of the team speculated that life might exist in similarly extreme conditions even on other worlds. It raises the possibility that organisms could survive even on planets whose surfaces have long since become lifeless. Li-Hung Lin et al., "Long-Term Sustainability of a High-Energy, Low-Diversity Crustal Biome" [abstract], 10.1126/science.1127376, p 479-482 v 314, Science, 20 Oct 2006. Dylan Chivian et al., conference poster: "Journey to the Center of the Earth: Life in the Deep Subsurface" [PDF summary], 21 May 2006. 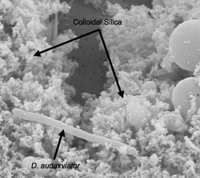 Two miles underground, strange bacteria are found thriving, News@Princeton, 20 Oct 2006. Gold mine holds life untouched by the Sun, by Debora MacKenzie, NewScientist.com news service, 19 Oct 2006. Bacteria That Use Radiated Water for Food, Newswise.com, 19 Oct 2006. Thanks, Jerry Chancellor and EurekAlert!. Once dismissed as junk, selfish or parasitic DNA, transposable elements or 'jumping genes' are now regarded as major players in many of the processes that reshape the genome and control the activity of its genes — Nature. Darwinian evolution was once thought to depend on single point mutations. Now we see the importance of horizontal gene transfer and the rearrangement of larger blocks of DNA. (Recognizable transposable elements (TEs) constitute 45% of the human genome!) This situation was not anticipated by the darwinian paradigm. However, in Cosmic Ancestry, evolutionary innovations depend on genetic programs that are acquired by transfer and installed by various processes. So to us the new understanding is not a surprise, but an affirmation. Christian Biémont and Cristina Vieira, "Genetics: Junk DNA as an evolutionary force" [text | editor's summary], 10.1038/443521a, p 521-524 v 443, Nature, 5 Oct 2005. Conserved Non-Genic Sequences is a related CA webpage. Thanks, Ron McGhee, for requesting additional comments. Can plants overwrite unhealthy genes? This was the conclusion of a study by botanists at Purdue University, published in March 2005. They wrote, plants ...can inherit allele-specific DNA sequence information that was not present in the chromosomal genome of their parents but was present in previous generations. Now a new study casts doubt on the finding. Botanists at UCLA cold not reproduce the earlier result and saw evidence that contamination could have been responsible for it. The subject remains open. Peng Peng et al., "Plant genetics: Increased outcrossing in hothead mutants" [abstract], v 443 Nature, online 27 Sep 2006. Radical genetic finding called into question, doi:10.1038/news060925-7, by Helen Pearson News@Nature.com, 27 Sep 2006. Plants can overwrite unhealthy genes — our What'sNEW article about the original result, 24 Mar 2005. Neo-Darwinism... is a related CA webpage. Ksenija Zahradka et al., "Reassembly of shattered chromosomes in Deinococcus radiodurans" [abstract], 10.1038/nature05160, p 569-573 v 443 Nature, 5 Oct (online 27 Sep) 2006. Susan T. Lovett, "Microbiology: Resurrecting a broken genome" [text], 10.1038/443517b, p 517-519 v 443 Nature, 5 Oct (online 27 Sep) 2006. Cheating DNA Death: How an Extremophile Repairs Shattered Chromosomes, Scientific American.com, 27 Sep 2006. How Is It Possible? is a related CA webpage. Life 2.0, The Economist, 31 Aug 2006. The Conference on Cosmic Dust and Panspermia honored the completion of Chandra Wickramasinghe's 33-year-long tenure of a professorship at the University of Cardiff and brought together researchers in areas of science that appear to have a bearing on the concept of panspermia. A majority of participants stood for a photo on the steps of the School of Mathematics, Friday, 8 September 2006. 1 David Tepfer. 2 Max Wallis. 3 Don Jewett. 4 Patrick McCafferty. 5 Richard Hoover. 6 Brig Klyce. 7 Olivia Temple. 8 Janaki Wickramasinghe. 9 Robert Temple. 10 Shirwan Al-Mufti. 11 Chandra Wickramasinghe. 12 Mark Burchell. 13 S Ramadurai. 14 Barry DiGregorio. 15 Gil Levin. 16 Godfrey Louis. 17 Athem Alsabti. 18 Bill Napier. 19 Steve Coulson. 20 Martin Line. 21 Yogesh Shouche. 22 Tom van Flandern. 23 Victor Clube. 24 Nori Miyake. Not pictured: Mike Baillie, Anthony Campbell, Milan Ćirković, Steve Eales, Siegfried Franck, Karen Junge, Benny Peiser, Jonathan Tate, Milton Wainwright, John Watkins, Anil Wickramasinghe, Priya Wickramasinghe, Ken Woodhouse. 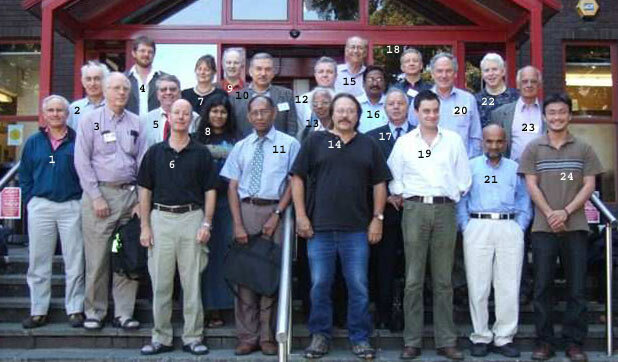 Cosmic Dust and Panspermia, Conference at Cardiff University, Cardiff UK from 5-8 September 2006. Chandra... is our main page about Chandra Wickramasinghe. Thanks for the photo, David Tepfer! Kathrin A. Dunlap et al., "Endogenous retroviruses regulate periimplantation placental growth and differentiation," 10.1073/pnas.0603836103 [abstract], Proc. Natl. Acad. Sci. USA, online 15 Sep 2006. The Ghost of Viruses Past, by Rhitu Chatterjee, ScienceNOW Daily News, 13 Sep 2006. Why viral stowaways are a baby's best friend, by Andy Coghlan, NewScientist.com news service, 12 Sep 2006. The Evolution Prize has its own domain and website now. News and discussion about the prize will be posted there. evolutionprize.net – the new website, launched 28 Aug 2006. The Evolution Prize is the local related CA webpage. Mitchell L. Sogin et al., "Microbial diversity in the deep sea and the underexplored 'rare biosphere'," doi:10.1073/pnas.0605127103, [abstract | open access pdf], p 12115-12120 v 103, Proc. Natl. Acad. Sci. USA, 8 Aug (online 31 Jul) 2006. News in brief: "Ocean hosts a reserve of rare genes" [text], p 498 v 442, Nature, 3 Aug 2006. Ocean Microbe Census Discovers Diverse World Of Rare Bacteria, ScienceDaily.com, 2 Sep 2006. Star Man, RedOrbit.com, 18 Aug 2006. Cosmic Dust and Panspermia, Conference at Cardiff University, Cardiff UK, 5-8 September 2006. Chandra Wickramasinghe is a related CA webpage. Did Life Arrive on a Comet?, Science & Nature Homepage, BBC, 9 Aug 2006. Electrified bugs soar into space and infest the galaxy, p 19 n 2562, New Scientist, 29 Jul 2006. Chandra Wickramasinghe discusses the red rain of Kerala in a online interview. The red rain fell along the southwest coast of India from July to September 2001, following a sonic boom believed to have been caused by a meteor airburst. Its red color came from microscopic red cells in the rainwater. Their source and nature are uncertain. "Extraterrestrial Life" in Red Rain of Kerala, India?, by Linda Moulton Howe, Earthfiles.com, 15 Jun 2006. Mysterious red cells might be aliens, by Jebediah Reed, CNN.com, 2 Jun 2006. The red rain of Kerala — our initial What'sNEW article about the investigation, with links to subsequent news, 23 Oct 2003. The case for life on Earth 3.8 billion years ago has been reinforced by a team of scientists from UCLA and the University of Colorado. Two members of the team, T. Mark Harrison and Stephen J. Mojzsis, participated in a study ten years ago claiming that rocks from Greenland's Akilia Island contained isotopic evidence for life so old. Sceptics soon challenged that study, and the evidence was carefully revisited. The new research is a comprehensive response to the critics, Harrison said. Residue of Life, Astrobiology Magazine, 1 Aug 2006. Life Before 3850 Million Years Ago? is the main related CA webpage. Segmental duplications are crucibles of evolution, diversity and disease, say pathologist Jeff Bailey and geneticist Evan Eichler. Their review analyzes these "SDs", or copy repeats, in depth, mainly in the primate lineage. Among primate SDs there is evidence for three categories, pericentromeric, interstitial and subtelomeric. Each, in general, was duplicated in a different time window. SDs make up 13.7% of the human genome, the highest percentage among all sequenced genomes. Of interest to us, the researchers observe, The duplication of genomic sequences is one of the primary mechanisms for the creation of new genes... by adaptive evolution, gene fusion or exon exaptation. Gene fusion and exon exaptation are consistent with the evolutionary mechanism we endorse on this website. The first mechanism, adaptive evolution (accelerated, non-synonymous point mutations), would uphold strict darwinism, if it can produce new genetic programs. But can it? The only example we found mentioned in this review was the expansion of gene families with related, not new, functions. It appears to us that adaptive evolution by itself only explores and optimizes within narrow ranges. If so, the mainstream theory of evolution still lacks a convincing account for new genetic programs. We highly recommend the review by Bailey and Eichler. 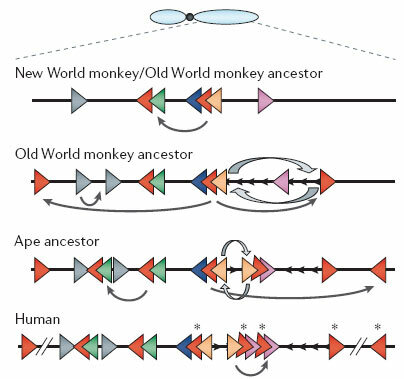 Jeffrey A. Bailey and Evan E. Eichler, "Primate segmental duplications: crucibles of evolution, diversity and disease" [abstract], 10.1038/nrg1895, p 552-564 v 7, Nature Reviews Genetics, July 2006.